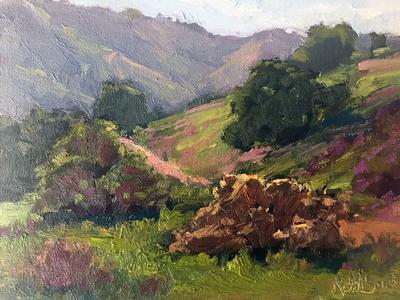 Kathleen Robison paints Laguna Beach landscapes all year long in the plein air fashion. She loves painting out in nature and capturing the natural beauty of Laguna Beach's many, many stunning sites. Kathleen paints impressionist-style paintings, with vibrant, beautiful colors that light up the canvas. Her favorite painting subjects include rolling hills, mountains, coastal scenes, figures on the beach, and any serene scene that adds beauty to the home.